Could Khameini's Ominous Sermon Be a Turning Point? Iranians knew that Friday prayer in Tehran on June 19 would be a turning point. For those tuning in to watch, its significance could be approached visually, like the old May Day parades in Moscow under the Soviet Union. You scan the faces of the people present to see who is there and who is not, attaching meaning to attendance. Among those there to hear the pronouncements of the Supreme Leader Ayatullah Ali Khamenei were most of the top leadership, including powerful personalities like Ali Larijani, the Speaker of Parliament, and one of his predecessors, Gholam-Ali Hadad Adel (who also happens to be related to Khamenei through the marriage of their children). The President, Mahmoud Ahmadinejad, was there too, as was one of his election rivals, Mohsen Rezaei. But dramatically absent were two other candidates for the presidency: Mir-Hossein Mousavi and Mehdi Karroubi. Also invisible was Ahmadinejad's true nemesis: Ayatullah Hashemi Rafsanjani. But Kremlinology was dispensed with once the Supreme Leader began speaking  and the country began to parse his words. He spoke of how "the enemy" had been plotting to declare the elections fraudulent even before the vote took place. He spoke of the illegality of street protests. The recent election, he said, was the most significant in the history of Iran, apart from the vote in 1979 that created the Islamic republic. Iranians, he said, should remember that their country represents a third way, the best way, between dictatorships and the false democracies that populate the rest of the world. 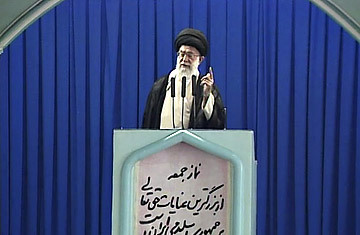 Khamenei dismissed accusations that the election was stolen. He said cheating occurs by way of small numbers, a vote here or there, a few thousand or 10,000. He indicated that an 11-million-vote margin could not be manufactured. Still, he said, the Guardian Council, which must certify the results, would recount ballots with representatives of all candidates present. In the meantime, he declared that the way of the law, rahe qanun, had to be respected and the violence in the streets brought to an end. He condemned the violent excesses of both the Basij (the volunteer paramilitary that supports Ahamdinejad), and the green-garbed backers of Mousavi. Khamenei demanded law and order over and over again. Qanun, qanun, qanun. But the real enemies in his eyes were still the U.S. and the West and the Zionists who wish to launch a velvet revolution in Iran. Those people are aqmaqha (idiots), he said, if they think they can undermine the Islamic republic. It was important to preserve the Iranian way created by the Ayatullah Khomeini in 1979. Khamenei did not deny there was controversy in the ranks. Indeed, he cast the crisis as a debate between the President and Rafsanjani, the most prominent supporter of Mousavi and the chairman of the powerful Assembly of Experts, which has the constitutional right to choose  and perhaps remove  the Supreme Leader. Mousavi, Karroubi and Rezaei were described as good men, but they seemed to be almost incidental characters in the drama Khamenei depicted. In a clear attempt to be evenhanded, Khamenei lauded Rafsanjani. He spoke of Ahmadinejad's campaign charges of corruption against the other Ayatullah and declared that Rafsanjani was not corrupt. It was a slap on the wrist for Ahmadinejad, whom Rafsanjani had threatened to sue over the comments. Yet in the end, in the wider debate between the President and the chairman of the Assembly of Experts, Khamenei took more of the President's side. That was the Supreme Leader's judgment, and it may be the guideline for his attempt to patch together the equivalent of a coalition government, one headed by Ahmadinejad but with substantial representation from Rafsanjani's political cohort. It was his vision of order. But that vision also sent another signal to Iranians: that in the battle of the streets, those who take Ahmadinejad's side are justified because the Supreme Leader has reiterated his support for the President. It was a thundering warning to the hundreds of thousands who wear green: Get off the streets. And the usually cool Supreme Leader knew he was delivering an ultimatum. He appeared angry and hot, at one time telling people who seemed to be interrupting him to keep quiet. And the sermon ended with weeping, with the Supreme Leader telling his people that he loved them more than they know. The coming days will show what that love is made of. Correction: The original version said that the Supreme Leader had praised former Interior Minister Abdullah Nouri, a reformist politician; Khamenei had actually praised another former Interior Minister, Ali Akbar Nateq-Nouri, who is also a critic of President Ahmadinejad.